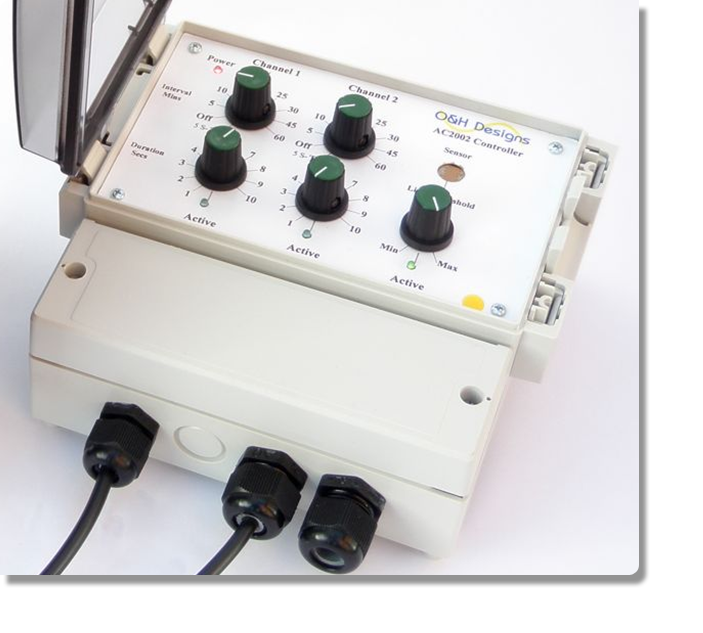 AC2002 Controller System - Designed for the Aquaculture Industry. This was primarily for controlling the quantity and feed duration of feed pellets for young fish. This two channel unit is sealed to IP65 and is accurately controlled via microprocessor. User programmable time Intervals can be set and light threshold sensor for dusk/dawn sensing. This twin channel unit is able to control up to eight hatchery feeders, however our design engineers, O & H Designs offer the flexibility to be able to construct and design a system of feeders and controllers to suit your specific application. A new single channel control unit is available now to control up to four feeders. AC2002 Controller System. Designed for the Aquaculture Industry. This was primarily for controlling the quantity and feed duration of feed pellets for young fish. This two channel unit is sealed to IP65 and is accurately controlled via microprocessor. User programmable time Intervals can be set and light threshold sensor for dusk/dawn sensing. The twin channel unit is able to control up to eight hatchery feeders, however our design engineers, O & H Designs offer the flexibility to be able to construct and design a system of feeders and controllers to suit your specific application.